The right-wing news corporation- which promotes the right to bear arms – has spent the last week teaching schoolchildren how to fight and disarm gunmen. Genius, because that obviously makes sense. The piss poor advice is exactly what the Department of Homeland Security recommends you do not do when your victim to an active shooter situation. They say you should either run away or hide. Host Elizabeth Hasselbeck asks a surprisingly sensible question to the martial arts instructor Tony Morrison if ‘we need to be having this conversation’. No, of course not. But he replies that we cannot keep our children sheltered and we must urge them to be vigilant. 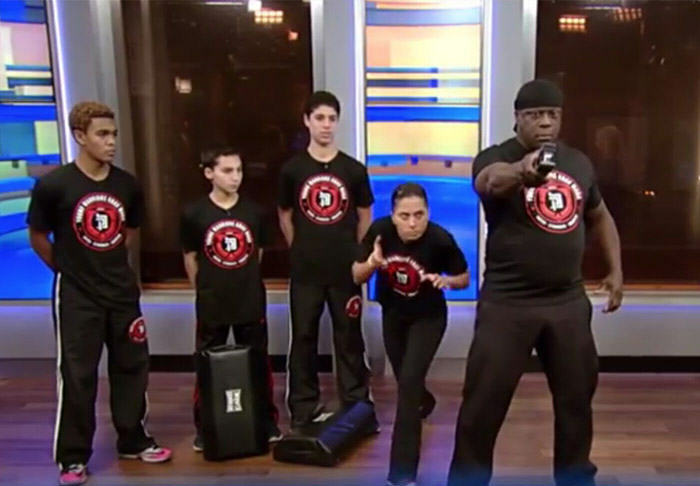 That’s when they start chatting about ‘active shooter’ drills these kids are put through at their schools before Morrison and his assistant, Sepi Melamed, demonstrate the batshit crazy techniques on how a child should approach a gunman (obviously), but in this case, a martial arts teacher with a stapler. Let me ask you this. You just turned and then used some moves on him. Do you keep running once you do that or do you actually turn and like fight, kick and get this guy down? Well, once you’ve engaged the gunman, you just have to take him out. You’re not actually going to try and get away and you’re going to make sure you’ve done some damage to him. I couldn’t imagine that ending well somehow. For four-minutes of the most American thing you’ve ever seen, watch the cringe clip below.